Google is making some changes to the Google Play Store, according to Android Police. For example, you might have noticed the darker colors that are now being employed on the app. The colors used for each category are the same (green for Home and Games, pink for Movies & TV, blue for books and red for Music), the only difference is the darker shade (see image at the top of this article). Other changes include a new layout for apps in the Google Play Store that makes it easier to read the version number of the app, the last date it was updated, the number of downloads, the update size, the launch date of the app and more. It also includes the logo used for the app ratings from the ESRB. When leaving ratings on an app, you might notice that Google now asks three questions about this particular app. For example, when reviewing ESPN you are asked whether the app offers podcasts, if it is good for play-by-play updates and good for video highlights. You have three pre-set response options: No, Not Sure and Yes. Another change brings new download animations to the Google Play Store, although this has not been widely seen at all. Instead of the progress bar, a circle around a small image of the app's icon marks the progress of the installation. A new addition to the Play Store's settings menu is called Protect My Updates. When toggled on, you will receive notification if other sources attempt to update your apps. Lastly, instead of a small green banner announcing that an app is holding an event or a sale, larger boxes will do the same on an app's listing page. Check out images of some of these changes by tapping on the slideshow below. If you have not received all of the new features, be patient. They are being pushed out now. Google’s Play Store is organized much better than Apples App Store. It’s just much more logical. Apple keeps making it much harder to drill down and find new apps. I actually agree with you. The App Store’s tab-based card UI looks dull. Information isn’t clearly indexed well and not enough of the UI estate is efficiently used . They just need more filtering & sorting options now. 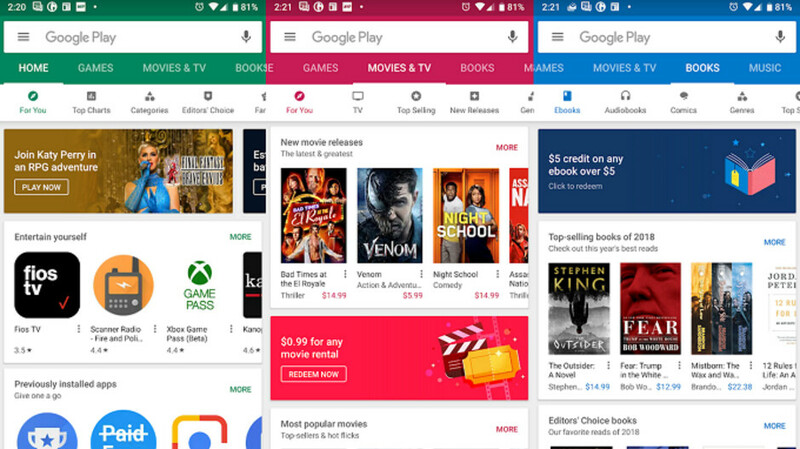 Play store's new changes make it easy to find apps great job Google!